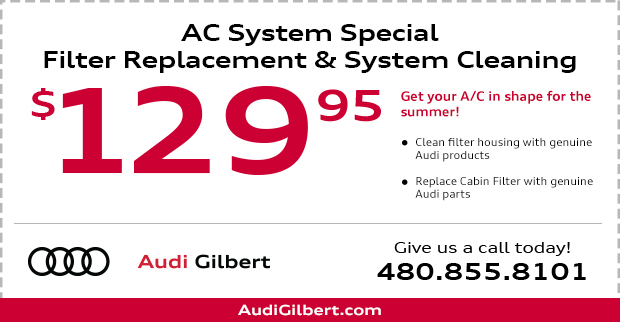 Audi Gilbert is proud to be your local Audi mechanic. Your Audi is built with precision engineering, so it pays to trust it to those who know it best--like our highly-trained, certified Audi technicians. In our quest to provide you with exceptional value, we offer these special incentives. Whether your Audi needs regular service like an oil change or something more in-depth, you'll find a variety of special offers here. Disclaimer for all: *Valid at Audi Gilbert on Audi vehicles only. Plus tax & fees if applicable. No cash value. Some models slightly higher. Offer not valid in conjunction with any other special or offers. Must present coupon at time of service write-up. Expires 6/17/2019. These coupons are only part of our top-tier customer service. We wouldn't be doing what we're doing without you, and we want to take this opportunity to thank you for choosing Audi Gilbert. We look forward to taking care of your Audi for years to come. Audi is more than just an automaker: it's a lifestyle. When you drive an Audi, it's a clear signal that you won't settle for anything less than the best in life. At Audi Gilbert, we know you expect nothing less--which is why our state-of-the-art service center is the place to bring your Audi for all its service and maintenance needs. Our technicians have been trained and certified by Audi, so they know the ins and outs of your car or SUV--and they regularly undergo more training so that they'll always be on the cutting edge. Furthermore, they'll use only genuine OEM and Audi-approved parts, fluids, filters, and accessories, so you can rest assured that your Audi will keep the same high quality it had when you first got it. 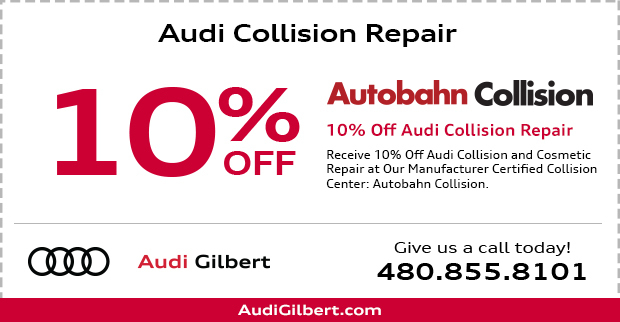 Proper maintenance, service, and repair on your Audi is worth every penny--but we still want to help you save. That's why we offer regularly updated service specials. They're a great way to save without compromising the high quality that comes from genuine Audi service. When you're ready for an appointment, give us a call or use our online service scheduling form. 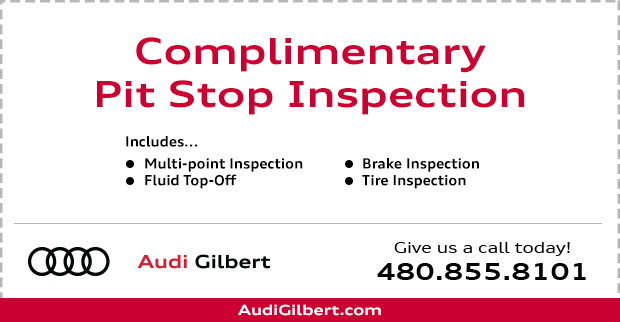 We look forward to serving you and your Audi at Audi Gilbert, located at 3235 S. Gilbert Road Gilbert, AZ 85297.